Mermaids Lagoon Ticket Redemption Arcade Machine is an exciting oceanic themed game which players must catch as many fish as possible with their harpoon to score big and win tickets. 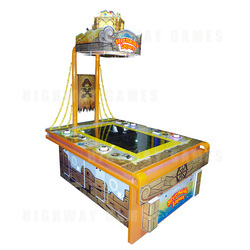 With super cute tropical fish and fun gameplay this machine is a smash hit in any location. In Mermaids Lagoon players simply turn the knob to adjust the angle of the harpoon and then push the SHOOT button to launch the harpoon and catch fish. This super exciting harpoon shooting game challenges players accuracy and timing skills. Win bonus points by snagging the Jellyfish when the treasure chests open.